Tag line: "As P.T. 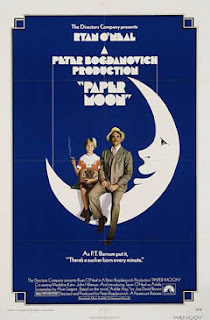 Barnum put it, 'There's a sucker born every minute'"
Despite being only ten years old at the time, Tatum O'Neal guided her character in Peter Bogdanovich’s 1973 comedy/drama, Paper Moon, far beyond the ‘cute little girl’ stereotype. In fact, her performance was strong enough to earn O'Neal an Academy Award for Best Supporting Actress, making her the youngest Oscar recipient ever in an acting category. At a time when most people are feeling the financial sting of the Great Depression, Moses Pray (Ryan O’Neal) is doing pretty well for himself. A con man, he travels from town to town across the American Midwest, stopping just long enough to cheat the occasional widow out of a portion of her inheritance. While attending a former girlfriend’s funeral, Moses is introduced to Addie (Tatum O’Neal), the 9-year-old daughter of the deceased. With nobody to look after the young girl, Moses agrees to drive Addie to her Aunt’s house in Missouri, but when he discovers she's just as skilled a con artist as he is, Moses instead makes Addie part of his act. Posing as father and daughter, the two are soon bringing in more money than Moses ever dreamed possible. By 1973, Ryan O’Neal was already a bankable movie star, whereas Paper Moon was his daughter, Tatum's, very first film. Yet in spite of her inexperience, the younger O'Neal not only keeps up with her famous dad, but upstages him on a number of occasions. When Moses runs into some trouble with a local sheriff while bilking the recently widowed Mrs. Bates (Yvonne Harrison) out of a few dollars, Addie comes to his rescue, and even succeeds in getting more money from Mrs. Bates than Moses would have. Being a natural grifter also gives Addie the edge in recognizing a swindle. Believing he's fallen in love, Moses invites his new girlfriend, exotic dancer Trixie Delight (Madeline Kahn), to tag along with them. Addie senses almost immediately that Trixie is after Moses’ money, and is so astute that Trixie, who's already pulled the wool over Moses' eyes, doesn’t even attempt to fool Addie. She knows this little girl can see right through her. Fortunately for Moses, Addie can see through most anybody. Addie appears in nearly every scene in Paper Moon, and Tatum O’Neal never once falters in her performance. Much like her character, who swindled countless dollars from a good many people, young Tatum herself managed to steal an entire motion picture. I haven't seen this movie in 1o-12 years. It was a good one, too. I couldn't believe how well she acted at that young age. By the way, I met Bogdonavich in Dallas at a film festival in Dallas about 4 years ago. he's a very quiet man. Got a few pictures with him and shared a cup of joe. By the way, August 10-12 I am hosting a blog fest entitled, "The Dog Days of Summer. Stop on by if you've the time. I was only 11 years old when I saw this movie with my late mother. I remember thinking what a great movie it was then & it is now. So much of a favourite that my partner brought a copy. The casting & acting is brilliant and the filming captured the depression perfectly. Jeremy: She did a great job in this movie. And I'm envious! i'd love to get a chance to meet Bogdanovich. If I get a chance, I'll definitely stop by your festival...sounds like it'll be a good time! H E: I can imagine this movie resonating with a youngster, seeing as it gave them a young heroine to identify with. and I agree with your comments 100%...it holds up well! I remember seeing this film when I was really young, just loving Tatum O'Neill's performance ... and that mischievous gleam she'd get in her eye before coming up with a new idea to get them in or out of trouble. I remember thinking, "We're not supposed to like them; they're the 'bad guys'," but finding it impossible not to root for them. (It was probably the first time I'd come across the concept of the likeable "Villain Protagonist" ... I think because Mose is on some level scrambling to survive is times, we forgive him ... not to mention he runs into and deals with worse characters). @jan-festival-of-films: They were lovable crooks, that's for sure! And Tatum O'Neal was a big reason why (though, as you say, Mose was just trying to survive in some difficult times). I never saw this movie until many, many years after its initial release. Because of all of the commercial hype I assumed it was, in fact, a lousy film. Imagine my surprise to realize that the hype was actually justified and that the movie is excellent. Every actor in it turns in a wonderful performance. And I don't care if she was only ten years old, Tatum O'Neal deserved that freaking Oscar. Her father should have gotten one, also for his portrayal of Moses Pray. Bogdonavich was spectacular as director, and the screenplay was brilliant. Just a freaking great movie.